$ heroku console Ruby console for codenote.heroku.com >> ENV['DATABASE_URL'] => "postgres://username:password@ec2-000-00-000-00.compute-1.amazonaws.com/dbname"
Reminder: Upgrade Your App to OAuth 2.0 and HTTPS by October 1st. 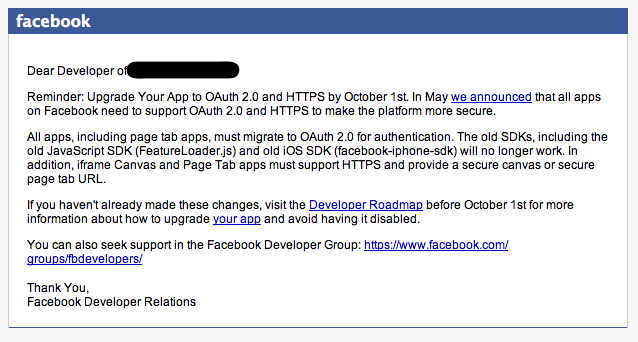 In May we announced that all apps on Facebook need to support OAuth 2.0 and HTTPS to make the platform more secure. 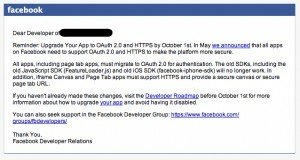 If you haven’t already made these changes, visit the Developer Roadmap before October 1st for more information about how to upgrade your app and avoid having it disabled.